If I’m going to make a mistake about my winter gear, I’d rather it be in my backyard than up in the mountains. It’s so much easier to abandon backyard camp in the middle of the night and crawl into a warm bed with my wife, then it is to figure a way off of the mountains if things didn’t go as planned. It was for this reason that I made the decision to run a test of my equipment last night. Temperatures were expected to drop into the single digits. With 23 mph winds, the wind chill factor would bottom out at around -11 Fahrenheit. It was my perfect storm. I erected my Warbonnet Blackbird double 1.1 hammock and strung the Edge tarp above it. The winds were so strong that three stakes were pulled out of the ground before I even crawled into it. The aluminum stakes had been snapped by the tarp like a whip and I had to crawl around with my headlamp to recover them; yards from where they had been sunk. This time I buried them all very deeply. I had just purchased a 20 degree Incubator from Hammock Gear. Obviously, the predicted temperature was going to be well-below its rated limit. So, I slipped a windshield reflector into the sheath area of the hammock . My top quilt is a 40 degree Hammock Burrow. However, the wind chills would take it nearly 50 degrees below its capability. Therefore, I unzipped my trusted EMS Downunder, 25 degree sleeping bag and used it as a secondary top quilt. I wore lightweight polyester baselayer bottoms and Prana Zion hiking pants. On top, I wore Columbia baselayer with Omniheat and an Under Armour lined shirt. On top of my head I wore my Columbia toboggan cap with Omniheat. 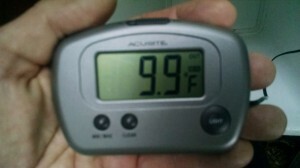 To gauge the test I used an AcuRite Thermometer. It records minimum and maximum temperatures at two locations. 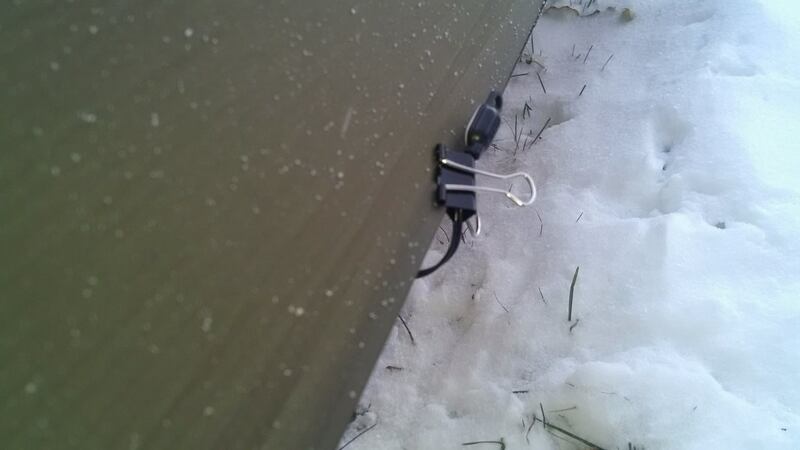 I clipped its tiny lead to the outside of the tarp to track the outside air temperature. I then kept the device tucked inside my double quilts to monitor the temperature near my body. I don’t have tarp doors and so the wind whistled through my shelter all night. 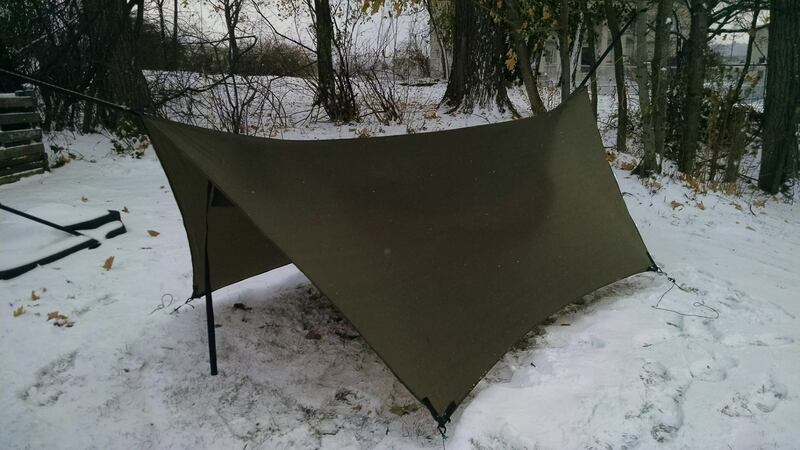 At times my hammock rocked and swayed and on a few occasions my face was pressed against the tarp (or vice versa). Fortunately, the EMS Downunder was long enough to pull over my head. To my surprise I remained warm and snug all night! I could feel one cold spot below me, but it wasn’t too bad. The Incubator UQ combined with a K-mart brand windshield screen provided just enough protection. I was absolutely amazed. With the wind blowing so strongly, I didn’t expect to make it all night. But, everything performed better than expected. I am one happy camper. The AcuRite recorded a low of 9.9 degrees Fahrenheit. The wind chill would have easily reached -11 degrees. Beneath the two quilts, next to my body, the temperature registered a balmy 71.6 degrees. I was completely comfortable. The worst part of the night was getting out of the hammock and dashing into the house! I don’t believe that the UQ would have done the job alone. However, with just the simple insertion of the windshield reflector, I was able to increase its resistance to the cold. The 40 degree TQ and 25 degree sleeping bag worked well together. Obviously, a lower-rated TQ might have done the trick alone, but I can’t test what I don’t have. Now, I have a better idea of what I can do in the woods. Good test. Awesome Dane – I was just kicking around the plans for this winters hike on the LHHT. Seems you have a solution setup – question would be how much weight is all this adding to your pack? 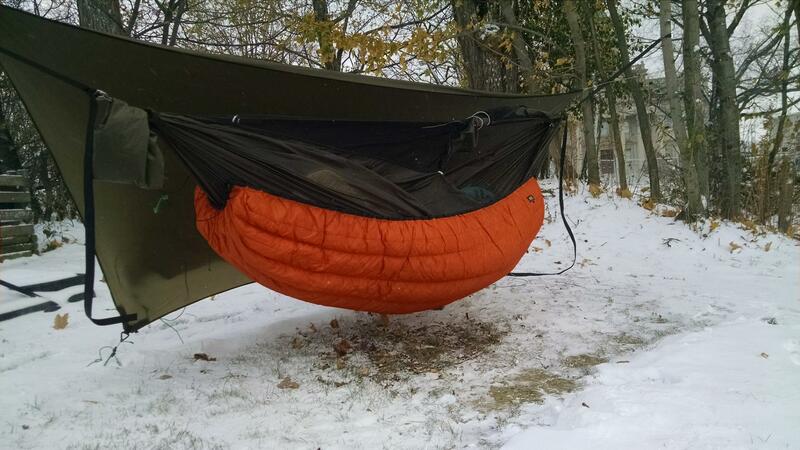 The hammock, tarp, and 40 degree top quilt would be standard for me for Spring and Fall. Therefore, the only added weight would be the 17 oz windshield screen and the EMS bag, which is around 2lb 10oz. Therefore, the difference between this set up and my normal Spring/Fall setup would be 3lb 11oz added weight. After the holidays we need to start planning a winter hike!